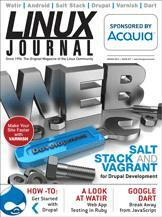 Build instant Drupal development environments with Vagrant and Salt Stack. Introducing Dart, the new Web language from Google. Your Web server called to say it's tired. Use Varnish to give it the break it deserves.